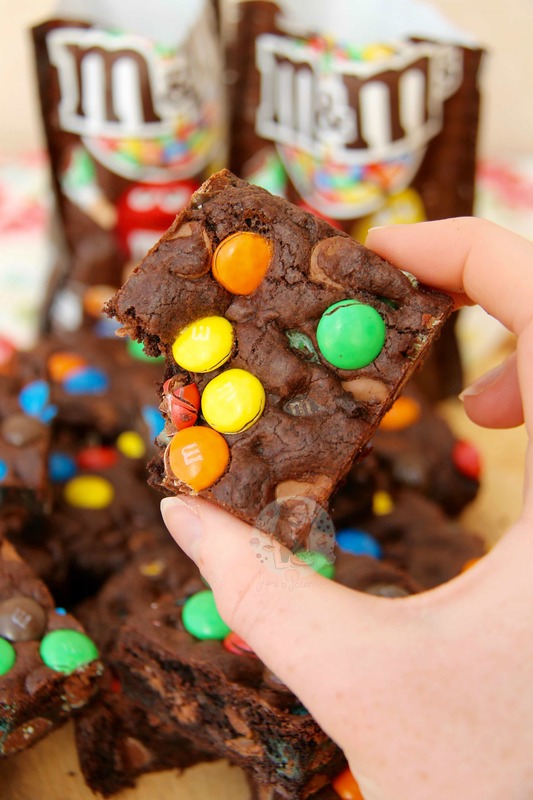 Super Chocolatey Cookie Dough full of M&M’s, making THE Most Delicious M&M Cookie Bars Ever! 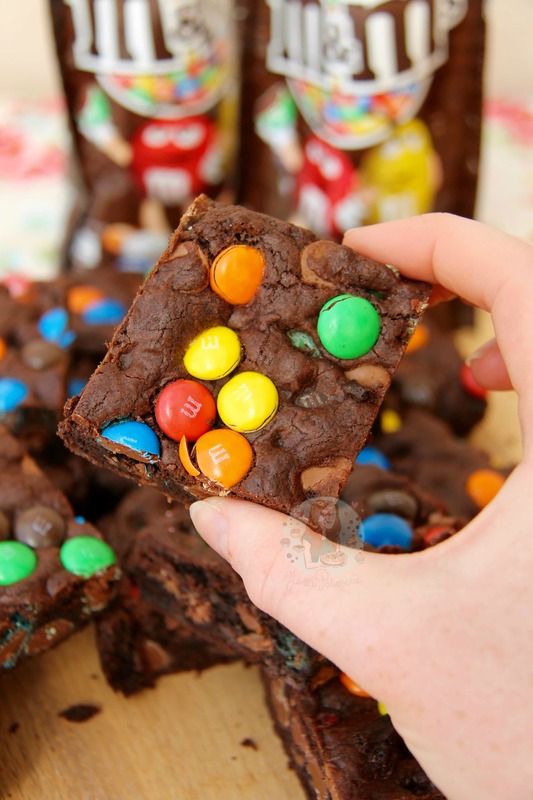 I have been after a Cookie Traybake recipe for SO LONG. I have struggled so many times as a majority of the recipes are american, and therefore in ‘Cup’ measurements, and no offence to anyone… but I hate Cup measurements. 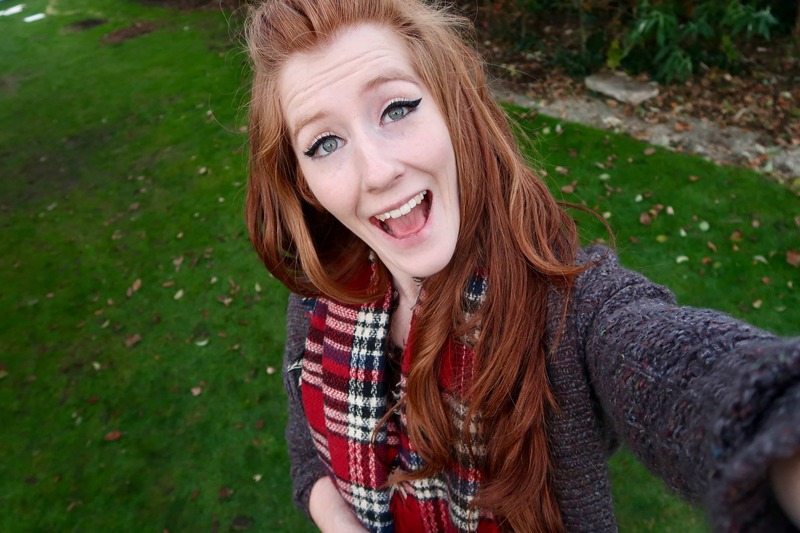 I just find them so unreliable and it just doesn’t make sense too me. After a good few hours of Pinterest searching for the next few months of baking inspiration, I saw some amazing cookie recipes. As I have a good few cookie recipes however, I tried Cookie Bars. 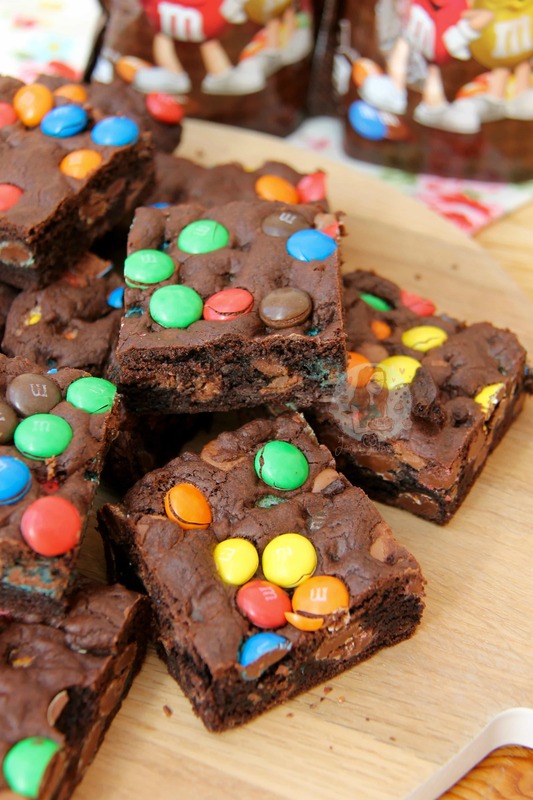 Something about these M&M Cookie Bars was just perfect. I did have to spend plenty of time however googling each weight of ‘cup’ measurement to find out what it was in grams, and when it didn’t entirely make sense I took a random stab at scaling up or down so make it a whole amount, and oh my days THESE ARE SO GOOD. Like, I have tried recipes before and they have utterly failed. I have had to bake some cookie bars in the oven for near enough an hour and a half, and they’ve been disgusting. These ones however, oh my, these ones. They took the correct amount of time to bake, with the random guessings of some ingredients, and they are SO YUMMY. I think I actually ended up annoying my parents by babbling on all day about how happy I was that these turned out so well. Seriously, every half hour I would say “I’m so proud about how amazing these are” and by the end of the day, my parents were finishing the sentence for me. But seriously, I didn’t know whether the colour of the M&M’s would run or not, but they didn’t. They stayed so bright and colourful, making sure these look perfect. The dark chocolatey style cookie base marries so well with the M&M’s. 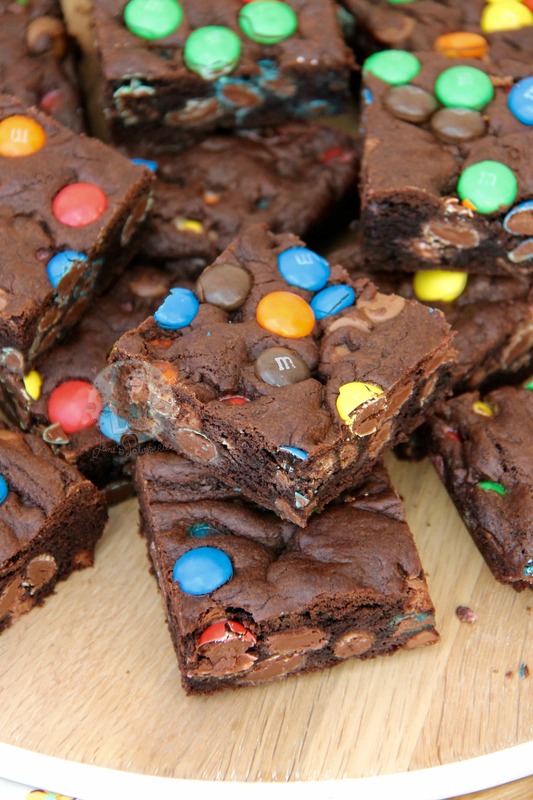 If you eat the cookie bars when they’re still slightly warm, the M&Ms are gooey, crunchy and amazing. 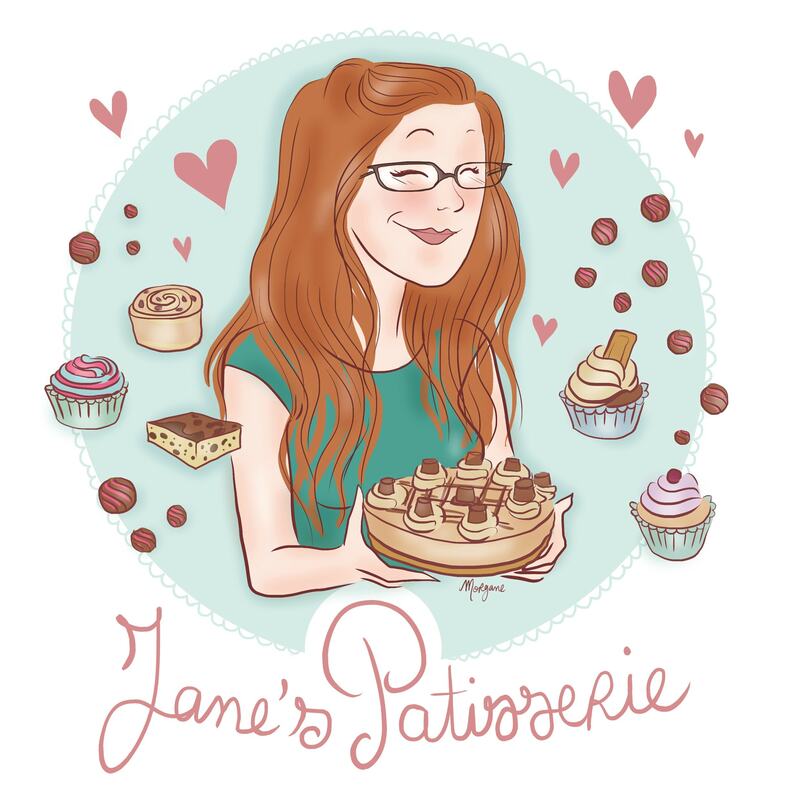 I changed a few ingredients slightly as I said because I wanted it to suit my style of baking. However, I have never imagined using Cornflour in the cookies, and I honestly think it contributes to how well these baked. I lowered the baking temperature slightly as the first time I made these they were maybe a tad overdone at 20 minutes, and with the temperature 10 degrees lower, they were perfect. I LOVE these bars, and I’m sure you will do too – enjoy! 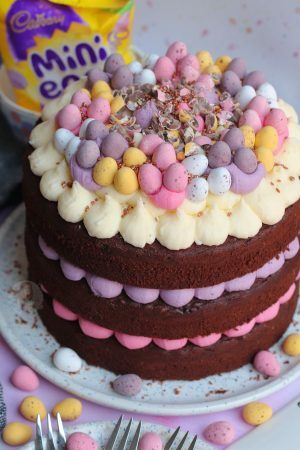 2) Whisk/Mix the Plain Flour, Cocoa Powder, Bicarbonate, Salt and Cornflour together so its evenly distributed – leave to the side. 3) In a larger bowl, melt the butter. Add in the two sugars, and whisk for about 2 minutes so the sugar starts to dissolve and the mixture is smooth. Add in the Egg and the Vanilla, and whisk again briefly till smooth. 4) Add in the Dry Ingredients, the M&Ms (leave back a handful), and mix with a spatula till a thick cookie dough is formed. 5) Press the mixture into the bottom of the tin and press in the handful of into the top for decoration. Bake the traybake in the oven for 18-20 minutes, until the top of the cookie bake looks ‘dry’ and a skewer comes out basically clean, bar a few crumbs. This delicious recipe is based on a recipe by Crunchy Creamy Sweet which I have adapted to grams, and swapped up slightly! I used oodles of Chocolate M&Ms in this recipe, and the colour on them stayed perfect even after baking, but I’m sure it would work with the Crunchy M&M’s, the Peanut M&M’s, or even smarties for example! Older Next post: Oreo Drip Cake! Newer Previous post: Mini Chocolate Chip Cheesecakes! I wish these were in metric measurement so we could try them in Canada. Oh my goodness these are amazing!! 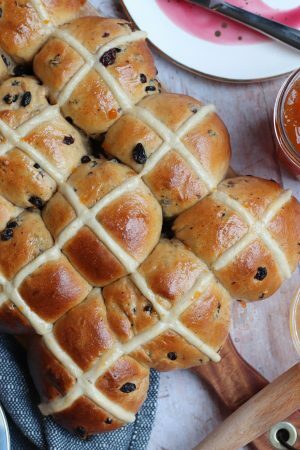 This is the second recipe from your blog I’ve tried and both have turned out great so I will certainly be trying more. Have been wanting to try some recipes for ages but we live out in the middle east and some brands of chocolate are difficult to find or the imported ones just don’t taste right. M&M’s seem to taste the same wherever they are made. We made these today and they were fantastic! Don’t think they will last long! Made these last week and they were fabulous! 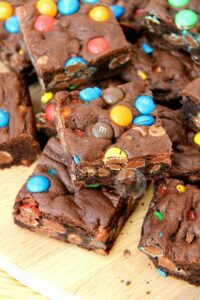 I’m planning to make them again with Reese’s Pieces and vegan margarine, so that they’re dairy free. The only downside is that I shall then have to share them with my lactose intolerant husband! 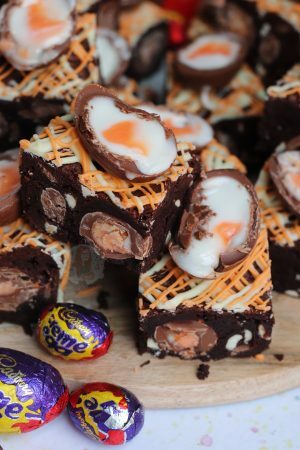 Hi, do you think I could use the same weight of mint aero (either bubbles or normal bar) in this recipe, or would it drastically effect the bake? Thanks! Ummm I’m not sure if I’m honest – it would affect the bake but I don’t know how badly? Maybe only put in one bar/bag and then some mint extract, and normal chocolate chips? Thanks – shall give it a go! Got to experiment sometimes. I made these today for work, it’s R U OK? Day today. 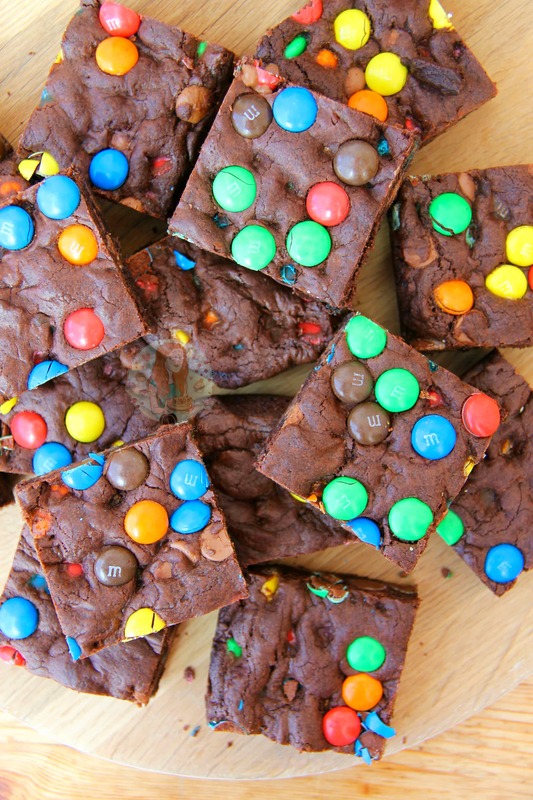 I used yellow M&M’s on top and they taste amazing! Although they didn’t turn out as fudge-y as they look in the pictures- mine are more cake-y. Any tips? Mine weren’t really fudgey, just more cookie like.. Maybe bake for a bit longer? Ok thanks- I’ll give that a try next time!